Not able to attend the meeting, but interested in participating? Click here to fill-out the online application. United Way of Monroe County is asking area residents, “Are you ready to reach your financial goals?” United Way, along with the Financial Stability Alliance, is continuing its free financial coaching program for individuals in our community. Financial coaching is quickly gaining recognition on a national level as a proven, effective way to help people significantly improve their financial well-being. 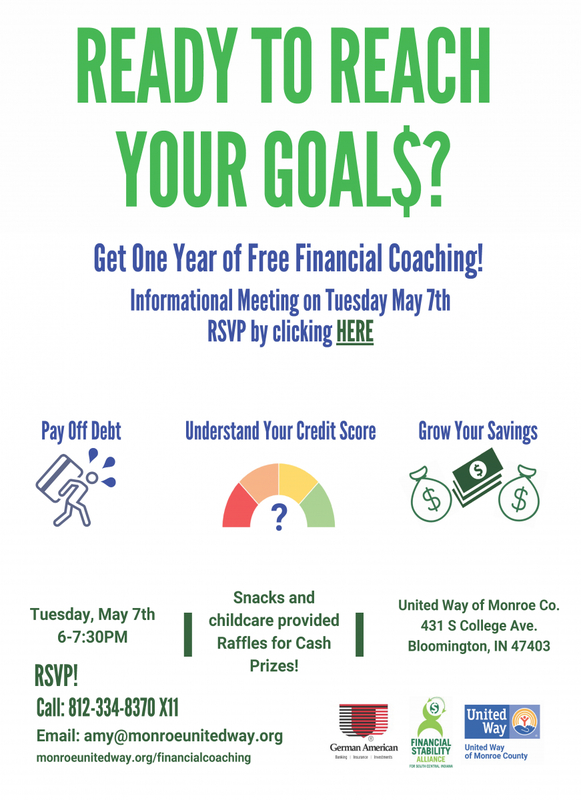 This program provides free financial coaching to participants from Monroe, Owen, and Greene counties. Participants work with a financial coach who helps create personalized goals and then they systematically work towards achieving them. Last year's participants increased their assets by an average of $2,674 and paid off $2,740 in debt. Additionally, 82% of participants increased their Financial Stability Score and 65% increased their credit score. Check out more in the 2018 Financial Coaching Impact Report. Today’s economic environment leaves many people struggling with their financial realities. According to a recent bankrate.com survey, 63% of people do not have enough savings to cover an unexpected $500 expense, and according to the NFCC 2015 Consumer Financial Literacy Survey, only 2 in 5 adults report having a budget and keeping close track of their spending. The PwC Employee Financial Wellness survey reported that finances are the #1 cause of stress on working individuals, and financial worries negatively impact employee’s overall health, relationships, and workplace productivity. Luckily, United Way's financial coaching program is here for you! United Way’s mission is to improve people’s lives by addressing critical needs today and working to reduce those needs tomorrow. Financial coaching participants will be better equipped to address their financial needs today while working toward their goals for a more financially stable future. United Way of Monroe County partners with Apprisen, a non-profit organization with 60 years of experience and over half a million people served, to provide the financial coaching service. In a series of individual, holistic coaching sessions over a 12 month period, participants will set personalized goals and create an action plan for achieving them, review credit reports/scores with the coach, learn how to address credit report issues, and identify ways to strengthen credit. Additionally, participants have access to free financial tools via webinars, social media, and money minute blog articles. Participants stay engaged in the process and remain accountable for progress toward their goals through regular follow-ups with their coach. Apprisen ensures their service is convenient for participants by offering several ways to connect with coaches: in-person, over the phone, or by email. German American Bank provides sponsorship support for the financial coaching program. The Financial Stability Alliance for South Central Indiana increases collaboration and information sharing among financial stability partners and service providers in Brown, Greene, Monroe, and Owen counties.